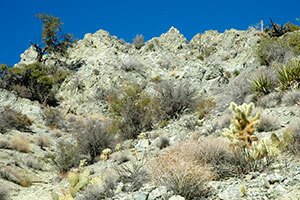 Library image #2960: Rock formations and Cholla cactus. The United States Congress designated the Santa Rosa Wilderness (map) in 1984 and it now has a total of 78,576 acres. All of this wilderness is located in California and is managed by the Bureau of Land Management and the Forest Service. Planning to Visit the Santa Rosa Wilderness? How to follow the seven standard Leave No Trace principles differs in different parts of the country (desert vs. Rocky Mountains). Click on any of the principles listed below to learn more about how they apply in the Santa Rosa Wilderness.